A significant ruling from the Fourth District Court of Appeal this week may have a large impact on the red-light cameras, not only in Broward and Palm Beach Counties, but throughout the State of Florida. The 4th DCA issued a 9 page opinion on Wednesday, dismissing a traffic ticket issued in 2011 as a result of a red-light violation. In its ruling, the court held that the city of Hollywood, Florida cannot delegate its legal authority to issue traffic tickets to a private, for-profit third party – in this case, American Traffic Solutions (ATS). ATS is a Phoenix, Arizona company that administers a majority of the red light cameras throughout the State of Florida. 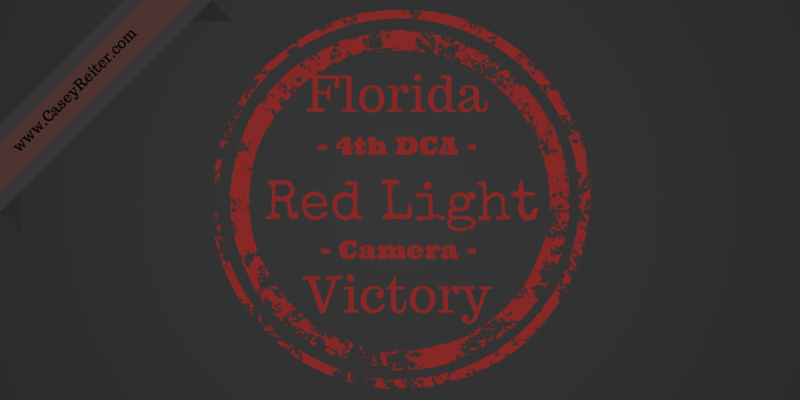 Basically, after someone runs a red light, the red-light camera sends the picture and video of the violation to ATS, who then reviews the video to determine if a violation occurred and then sends the information to the applicable Florida Law Enforcement agency. “For all practical purposes, it is the vendor that decides which cases the TIEO [Traffic Infraction Enforcement Officer] gets to review; it is the vendor who initially determines who is subject to prosecution for a red light violation; it is the vendor that obtains the information necessary for the completion of the citation; it is the vendor that creates the actual citation; it is the vendor that issues the citation to the registered owner of the vehicle; and, it is the vendor that eventually transmits the traffic citation data to the court. . . . Although the City may have some input into who eventually is prosecuted, that decision is wholly dependent upon the vendor’s initial determination.